Although these automated systems may often live longer than the traditional technology of the past, they still require occasional maintenance and testing so that they may continue protecting your family throughout the year. The start of the new year is the perfect time to perform a check up on your wireless security and fire alarm systems. Although these automated systems may often live longer than the traditional technology of the past, they still require occasional maintenance and testing so that they may continue protecting your family throughout the year. If you have not checked these systems in a while, consider starting the new year with these best practices for system maintenance. 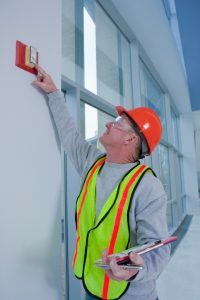 When all is well, your smoke detectors and fire alarm systems are easily forgotten, especially if you haven’t heard from them in a while in your home or business. While this peace and quiet may be nice in your daily routine, it is important to check your smoke detectors to ensure that there are no dead batteries or operational issues. This test is usually as simple as pressing the test button on the device, and well worth the time if there is a fire risk in the future. Your wireless systems are only as useful as the batteries in their devices, so if they are holding dead batteries, it may be a good time to switch them out for the year. If these devices are operating on wifi, it also is best to check the connection and make sure that is secure from any threats that may jeopardize the safety of your network. If you have a video surveillance system in your home, consider taking your cameras down for a quick lens cleaning. A fogged or dirty lens can prevent you from seeing your security footage clearly, making it less useful as a security measure in the long term. In doing this, you are ensuring the effectiveness of this system by making sure that you can get a clearer picture and feed from the device when you are using it. If you are ever unsure about the effectiveness or functionality of your fire, security, or surveillance devices, it is always best to consult a professional who understands the proper tests and safety precautions needed for these systems to work. By utilizing their expertise, you can ensure the safety of your family by knowing that each and every system in your home is working as it should be throughout the year. This entry was posted on Tuesday, January 16th, 2018 at 9:00 am. Both comments and pings are currently closed.